Internet shop: "Tokyo Pen Shop Quill"
Shop in Tokyo: "Asahiya Kami Bunguten Co., Ltd."
My name is Yasukazu Hagiwara, and I am the manager of this shop. It was founded by my grandmother Sachi, who was born in a stationery store called “Ohyama-Kamiten”, in the year 1910. The stationery store was in Kanda, Tokyo, near Akihabara. 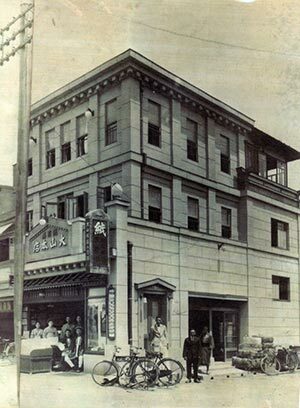 The old photo on the left is of "Ohyama-Kamiten", taken around 1925, and at the entrance of the store, pictured second from the left is 15-year-old Sachi. A few years later, she left home and got married, and then started her own business, founding the "Asahiya-Kami-Bunguten" stationery store in 1931. I am the third generation of owners of this shop. Ohyama-Kamiten, where Sachi was born, mainly sold paper, but at her own shop, she wanted to bring joy to customers by offering various kinds of stationery. Therefore, since her generation, we have been selling fountain pens and ink, stationery, notepads, and of course, paper. More than 80 years have passed since Asahiya-Kami-Bunguten's opening. During that time, things such as PCs, E-mail, and mobile phones have been invented, and they have become a very big part in peoples' lives. People nowadays are able to communicate without necessarily using pen and paper. Still, we at Asahiya love writing by hand because we believe that hand-written messages contain feeling, warmth, and sincerity. We believe that handwriting is a part of culture and therefore, very important. So, we love all those who have a passion for writing by hand, and we want to please them. By the way, dating back to even before the fountain pen, there was the quill pen. 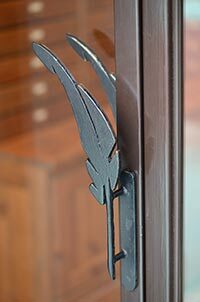 The doorknob at the entrance of our current store in Tokyo is in the form of a quill pen, so our customer's first impression is Tradition. We want to welcome those who love fountain pens, from their first moment of contact with our shop. It was for this reason, that I decided "Tokyo Pen Shop Quill" to be the name of this internet shop. 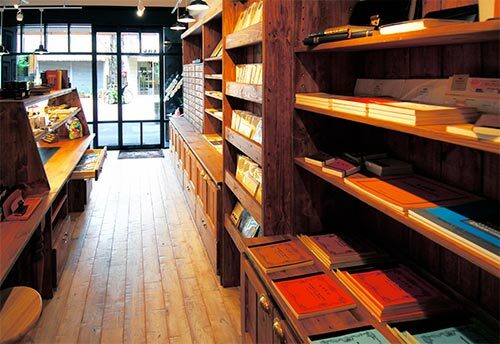 We want to be a shop that will be loved by fountain pen users all over the world. Our policy is honest business. Too often, what discount stores sell to customers, are the same samples those customers use for trying out the product. If you're in an actual shop when you buy, you can judge with your own eyes whether it is really new, but it is difficult to tell with internet shopping. We would never do such things. It should be standard everywhere else as well, but we will always sell genuinely brand-new items. We always keep our sample items and for-sale items separate. Please take a look at the left photo. The sample fountain pens for customers to try out the product, have our shop's name and the nib type engraved on each body, and we have all nib types. Once the customer has chosen what type of pen they would like, we sell them a brand-new one from the stock. We carefully check each product before it is sold to the customer, and the same goes for our internet shop; our quality and policy do not change. We are an authorized dealer of each manufacturer, and we do not carry unauthentic products. By all means, please take confidence when you shop with us. Upholding the best quality of products which are sold to customers is a natural obligation for any shop. Another thing that I would like for you to notice, are our carefully selected items. 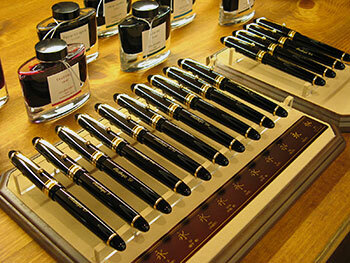 I, the shopkeeper, am one of those who love the fountain pen. Therefore, I only deal with products that I would personally recommend after I've tested them. I do not choose our selection only from catalog data. I always test the actual products, and not only for fountain pens. When it comes to paper products such as notebooks and stationery, we choose by test-writing on them using variety of manufacturers' ink. We post photos of the test results on this site, so we hope it will be useful for you. This is a picture of the staff. On the left is myself, Yasukazu, and my wife, Hidemi on the right. In the middle is Nobu from Yamato Transport. Yamato Transport has the highest share, and is the most-trusted transporting company in Japan. They are well-known as a company that treats the customers' parcels with care. In fact, we've never had even one mishap with them. They come to pick up parcels in our shop every day, and transport them to the overseas shipment center from our shop. Our actual shop is located in a town called Kugahara, in the south of Tokyo. From Kugahara Station, our shop is approximately 200 meters to the east. The name of the street is "Lilac Street". If you ever have the opportunity to come to Japan, please visit us. Press the "Play" button, you can see the route to the shop from station.